Want to start your own SUP Crew? Fill out the SUP Crew Application . A SUP Crew is typically a small, social group of people that reside in a similar location and share an affinity for stand up paddle boarding. The crew is started by one SUP enthusiast -the Crew Founder- and with the help of Tower, can grow into a much larger, yet geographically convenient group. Instead of joining together, crews can also compete. Whatever you decide to do, Tower SUPports you! The first crew in a designated city will be the Tower 1 Crew of that area with your specific area code as the crew identifier (e.g., Tower 1 | 858). Others in the same locale will have the choice to either join the crew or compete against them. Earn rewards for being active in your community by spreading the sport of SUP! Exclusive access to VIP Tower news, events, etc. 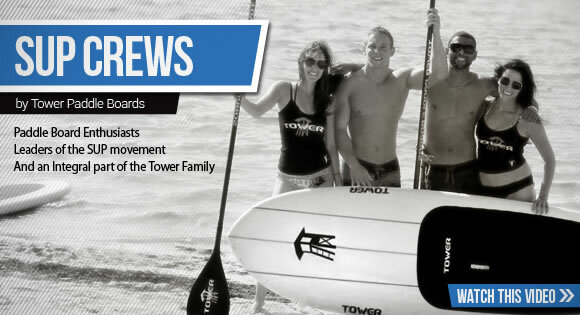 SUP Crews are part of the Tower family. We are very selective when choosing our SUP Crew Founders. Though there are not specific set-in-stone requirements, we look for certain types of people to be part of this exclusive program. We will let you know within a week of filling out the SUP Crew Application whether or not you have been accepted into the program. "Tower 3 | 212" is the 3rd crew established in the 212 area code (New York). The lower your Tower number, the more "pioneering" your stand up paddle board crew is in your local area. Owning Tower 1 for your area code, of course, comes with all the requisite bragging rights. Claim your Tower # today! We create and customize a Facebook group specific to your SUP Crew. Your crew has the opportunity to advance up to 4 levels, each level having progressively better perks and rewards. You are given the opportunity to recieve a unique affiliate link to allow you to receive credit for any referral purchases you generate. Step 1: Get set up on Facebook. Tower will set-up a Facebook group for your crew and make you the administrator. Your FB group page will act as your Crew website and communication platform. This is a key component of the program and where all of your activity will be monitored, reviewed and rewarded. Step 2: Personalize your group page and invite any local SUP friends you already have to join. It is up to you to personalize and effectively manage your group page. Keep your members involved through posts, discussions, and event creation. It is also up to you to approve member requests and invite those you want to join. If you need help recruiting members, just ask! Tower is here to help! Each Crew Level reaps different rewards and benefits. Generally speaking, as you move up the ladder, the value of being a Tower SUP Crew Founder increases. In surfing, crews are a natural phenomenon. Over time, classmates, co-workers, and/or neighbors that take to surfing will find one another. Often times they'll start seeing one another at the same local surf breaks and naturally strike up a camaraderie. Thus the initiation of a surf crew is geographically oriented around some home base. A few surfers connect and pretty soon it grows into a tight crew of 4 or 5 like-minded individuals. This is the core of a surf crew. For some crews, that's where it caps out. Maybe there are a few satellite members. Other crews develop a loose network of 5-10 surfers. In surfing, the tendency is to strictly limit size of the crew because there's only so much room at any particular surf break. If the crew is out there, they kind of take over the whole break and random non-locals may find themselves getting boxed out on waves. The attitude kind of becomes, "We live here. This is our break." People from other areas are kind of considered "guests". It's not always an antagonistic thing, but it just is what it is. Once the core crew is formed, the implication is that anyone else that gets introduced or invited in as a guest has to be "vouched" for by one of the core crew members. You don't just invite anyone along for a surf, and if you invite the wrong person in too often you may soon find yourself on the outside looking in. In addition to forming a group for the purpose of surfing, most surf crews naturally extend into one another's more expansive social networks. The crew becomes the nucleus of a larger social group - girlfriends, buddies, family, and such. Out of the water, it's not uncommon for the crew to spontaneously put together a party with 20-50 people pretty easily. There's usually a home base - someone's house, the dead end of a beach adjacent street, a particular staircase leading down to the beach, and often times a certain lifeguard tower. This is the inspiration for the Tower brand. Lifeguard towers are great geographic markers on the beach and thus are a natural meet-up spot. This local landmark can serve to sort of identify and connect a surf crew. That's our hope at Tower - to connect thousands of SUP enthusiasts together to form their own local SUP crews and to enhance their social and active lives in the process. We understand SUP crews, and with the help of modern social media (we understand that too), we can help you find your own crew... even if you're the 1st stand up paddler ever on your local body of water. It's a pioneering sport. Help us spread the word on SUP and we'll help you find your crew! Find a SUP Crew Near You!